My husband is a big gamer. He is also very loud and animated when he plays. He used to have a bit of our dining table earmarked for his computer. But I decided to move him into the pantry instead so it would be quieter for the boys! The room has had a lick of paint and new flooring, so don’t feel too sorry for him. I also had the opportunity to review some Forex prints from Posterlounge which has really transformed his room! 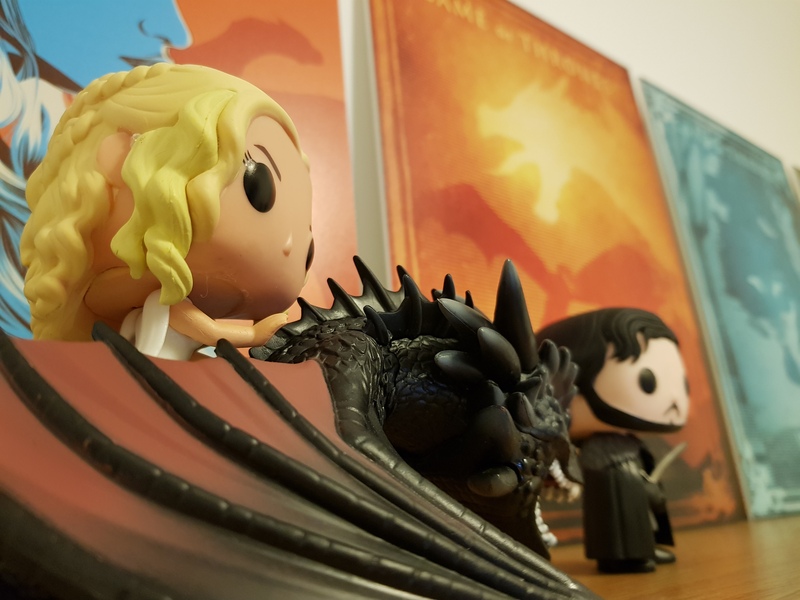 He decided to go with a Game of Thrones theme as he already had a couple of Game of Throne Funko Pop! figures on his shelf. He is thrilled to get it all in place before Season 8 premieres. I don’t think I will see as much of my husband now his room is set up so agreeably. My husband eventually plans is to do online streaming, so he is glad his backdrop looks a bit more interesting now. Forex is a great material choice. It’s light weight and sturdy. But most importantly the print colours are very vivid. Perfect when you want some visual appeal in the background when your streaming. His favourite is the Daenerys Targaryen print (£22.95) as its quite bright and bold. I love the contrast of the colours. We went for 30 x 40cm size which meant he could comfortably fit four in along his shelf. He is debating whether to screw them in, handily you get all the brackets included with you order. But for now, he just wanted to get them displayed as quickly as possible. I don’t know if anything will come of his aims to be a streamer but just setting up his room is making him so happy! Being sent these prints to review has made him clear up his shelf. Before the prints he had got a little cluttered on there. It’s so easy to get into a bad habit, its good it has forced him to improve the overall presentation of the room. Let’s be honest the pantry isn’t spacious, but it serves a purpose and since he added the prints it looks fantastic. It’s amazing what difference wall art has made to the appearance of the room. The other prints are Targaryen, Winter is coming and Winter is here. If you have Game of Thrones fans in the family these would make wonderful gifts. I have a £50 voucher to spend at Posterlounge if you would like to enter please fill out the form below by the 22nd of February. Don’t forget to check out my other competitions too!